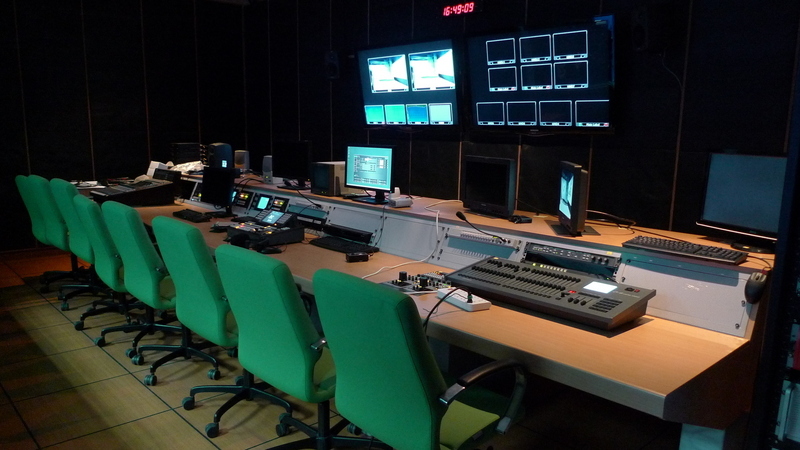 An American journalist friend of mine is teaching a television documentary production class at the Faculty of Communication Arts at Chulalongkorn University, Thailand’s premier secondary school. Since I graduated as a Communication major with a TV production emphasis, I tagged along on a visit to the university, curious to see how a modern production facility compares to what I learned in nearly twenty years ago. One cool thing that didn’t exist back in my day is the virtual studio. 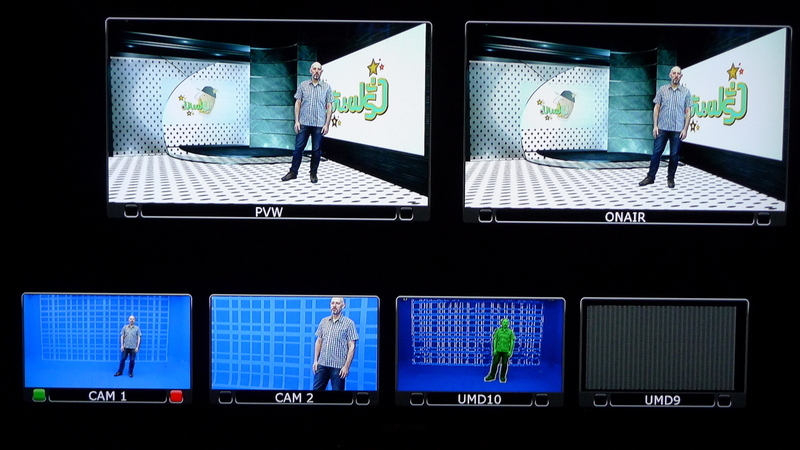 Using the principle of the chroma key (often called the “green screen effect”), the background of the image is created digitally. 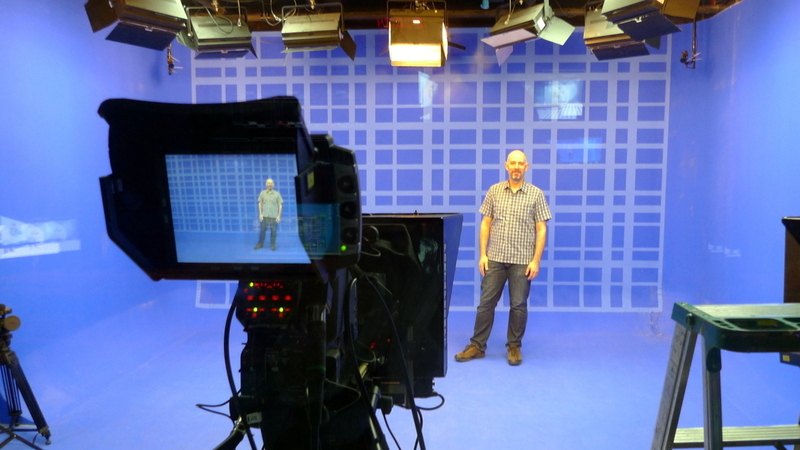 There is nothing on the studio walls other than a grid that can be used to ensure the effects’ perspective is lined up correctly. Within the control room, you can see how I’ve been placed “on set” for a Thai TV show. The most interesting thing is how there is ostensibly a raised platform behind me with a mirrored front surface. Of course, that platform doesn’t really exist. What happens if I walk back there and try to step onto it? Of course, my own career hasn’t followed my TV emphasis that closely (except for my youtube channel! ), but other aspects of my Communication degree have proved helpful. Still, it is hard not to visit Chula’s studio and not feel the desire to reengage with TV production, an art I really enjoyed. This entry was posted in Uncategorized and tagged Chula, Chulalongkorn, Communication, Digital, Education, Major, Production, school, Studio, Television, TV, University, Virtual by christao408. Bookmark the permalink. Reminds me of doing a weather report! Interesting post, esp. the virtual studio part. I am perplexed and now wonder how much is real and fake on TV. That is interesting. And what fun that must have been. I think your YouTube videos are very well produced. I think you should get a small studio and produce your own shows. Maybe after Tawn is established, you will have your turn to explore TV – bet you could find a niche! Amazing. This is simply amazing and I am impressed. Yeah so good that you know so many aspects of various productions. I agree with Matt.You should have your own studio and produce your shows. I enjoy watching your YouTube videos. what an interesting experience. i would never imagine myself to be on tv. i have a feeling that if you were living in japan now, you would be appearing on tv in no time. @rudyhou – As the gaijin who speaks no Japanese! =D@ZSA_MD – @ElusiveWords – Well, thank you. My “studio” is my macbook computer, although if I had the space, I’d upgrade to something larger and more powerful. @murisopsis – When he is rich and can buy me my own studio! @beowulf222 – @Grannys_Place – Well, it does cause one to wonder how much of what we see on TV is digitally added. I suspect the answer is “quite a bit!”@CurryPuffy – Yes, when I blow really hard the clouds will move. @Ikwa – It was neat to go back and see how things have advanced. Actually, next time I’m back in the SF Bay Area, I need to stop by my alma mater and see how things have evolved there. @christao408 – hahaha… and they would love you still. they actually have a tv program where they invite expatriates to comment on japanese culture and daily this-n-that. and it’s an english-speaking program. @rudyhou – Perhaps I need to move? @rudyhou – Nah, will just wallow in anonymity.